« 30th Anniversary Of Italy Biker Fest May 19-22, 2016. Double The Fun Riding There. Published by Cyril Huze May 12th, 2016	in Controls, Customs and Editorial. The all-new Spear Collection of grips and foot control accessories is designed specifically for the new generation of Indian motorcycles. It puts an emphasis on form and function using the latest in vibration-reducing technology. All products are cast from chrome-plated A380 aluminum with coordinating accented features. Premium EPDM soft rubber inserts help carry the traditional spear theme throughout, while also offering reduced vibration and a secure feel in any riding conditions. Spear Grips. Raised rubber inserts are embedded into the housings instead of glued on, creating air pockets that absorb harsh road vibrations for less hand and forearm fatigue. Includes machined aluminum end caps with matching arrowhead design., • P/N 5635: ’14-’16 Chief Classic, Chieftain, Dark Horse, Springfield & Vintage. • P/N 5636: ’15-’16 Scout, & Universal for 7/8” Diameter Handlebars. MSRP: $89.99. Spear Driver Floorboard Inserts. Inserts feature a slightly larger profile than stock and include 1/4-inch spacers for overall improved foot positioning and support. The accented chrome and bold spear design that’s prominently displayed completely transforms the appearance of the ribbed factory floorboards. Available as direct replacements on all ’14-’16 Indian models (except Scouts). • P/N 5650: ’14-’16 Indian Models (except Scouts) MSRP: $169.99. Spear Mini Boards. They utilize model-specific Splined Adapters to position the boards forward, back or center at almost any angle to dial in ideal positioning. A compact package for use in rider or passenger peg locations. 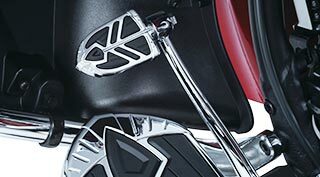 Installation requires separate purchase of model-specific Splined Adapters: Chief & Chieftain models require P/N 8828 for rear passenger mount, Roadmaster & Springfield models require P/N 8829 for rear passenger mount, and Scout models require P/N 8836 for use on driver or passenger mounts (if equipped with Indian Accessory Passenger Mounts). • P/N 5652 Spear Mini Boards without Adapter. MSRP: $89.99. Spear Brake Pedal. The accented arrowhead-shaped housing measures 4.5” wide x 3” tall and provides a secure feel for the brake pedal in wet or dry conditions. Installation is hassle-free and reuses stock hardware on all ’14-’16 Indian models (except Scouts). • P/N 5654: ’14-’16 Indian Models (except Scout) MSRP: $59.99. Spear Shift & Brake Peg. 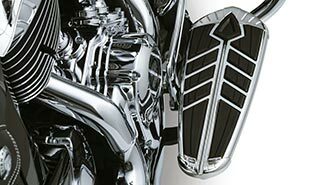 Available as a bolt-on replacement for the shift peg on Chief, Chieftain and Roadmaster models, as well as both the shift and brake peg on Scout models. A much wider profile than the stock peg offers easy and secure engagement, along with a sharp new look. They are a direct replacement for a wide variety of Victory models, including the all-new Octane. • P/N 5655: ’14-’16 Indian Models (Shift Peg Only), ’15-’16 Scout (Shift & Brake) MSRP: $39.99. Indian should stay as far away from this as possible. Bought 5 floorboard sets for my dealership. Sold within a week and can’t keep enough in stock. 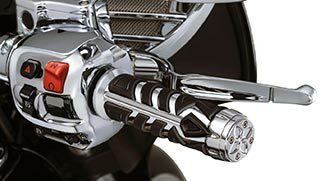 Nice job Kuryakyn….keep this stuff coming! I’ve seen worse that’s for sure. What the hell is wrong with people…. I don’t think they’re any more offensive than a giant rendering of a Native American on the tank. In that context they look perfect and fit right in. Superbe ,cela représente les flèches!